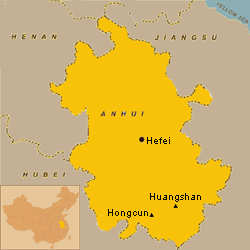 Anhui is located in the inland of China’s Southeast. It has several travel attractions such as beautiful ancient stone villages along the banks of the Yangtze River, former residences of local Anhui merchants, and impressive mountains. 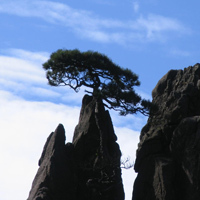 The Huangshan (Yellow Mountain) is one of the most renowned mountains China. Its spectacular peaks, surrounded by clouds and trees, made it achieve World Heritage Site status. To enjoy the sun rising on the top of Huangshan is a breathtaking and inspiring experience. Also the Mount Jiuhua, one of the four famous Buddhist Mountains, and the Mount Tian Zhu are well-known scenic spots. In Southern Anhui there are well-preserved ancient villages, derived from the Ming and Qing Dynasties, like Xidi, Hongcun and Yixian. In Shexiang County, reputed as Town of Arches, you still can find fine examples of residential architecture of this period and the unique Tangyue Memorial Archway.